KANNAPOLIS, North Carolina (Sept. 5, 2018) – The No. 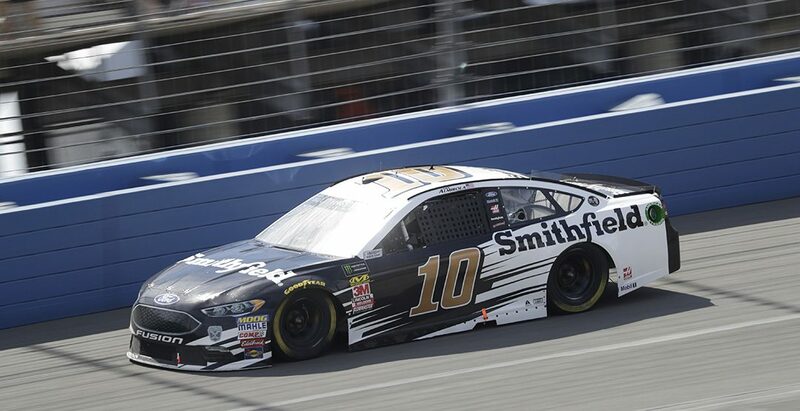 10 Smithfield Ford Fusion team for Stewart-Haas Racing (SHR) with Aric Almirola behind the wheel heads to Indianapolis Motor Speedway this weekend for the final race of the Monster Energy NASCAR Cup Series regular season. Almirola and his three SHR teammates have all clinched spots in the 16-driver Cup Series playoff field that will vie for the championship over the final 10 weeks of the season, culminating Nov. 18 at Homestead-Miami (Fla.) Speedway. This is the second time in Almirola’s Cup Series career that he has the chance to vie for the championship. The 34-year-old previously contended for the championship in 2014. This season also marks the first time crew chief John Klausmeier enters the playoffs in his role as the leader of a team. Currently, Klausmeier is the only first-year crew chief in the running for this year’s ultimate prize. Even though it’s the University of Maryland, Baltimore County graduate’s freshman year as a crew chief, he’s experienced when it comes to playoff pressure from his engineering tenure with SHR driver Kurt Busch. Almirola heads to Indy with six Cup Series starts at the iconic speedway. He has a best finish of 13th, which he earned last year at the 2.5-mile, rectangular track. The Ford driver also has one NASCAR Xfinity Series start at Indy, having piloted the No. 98 Ford Mustang to a 14th-place finish in 2015 while driving for Biagi-DenBeste Racing. The clock is ticking on the summer season, and the opportunity to submit your “Hero of the Grill” for the No. 10 Ford Fusion has now closed. Smithfield’s “Hero of the Grill” contest was launched earlier this year by Almirola and five-time world-champion barbecue pitmaster Tuffy Stone. Fans had the chance to nominate their favorite grill hero by visiting SmithfieldGetGrilling.com. One “Hero of the Grill” nominee will win $5,000. Plus, up to 10,000 nominees will have the chance to see their name featured on Almirola’s No. 10 Smithfield Ford at Richmond (Va.) Raceway in September. Indy marks the 23rd points-paying event during which the Smithfield livery has adorned Almirola’s No. 10 Ford Fusion. Smithfield, a brand of Smithfield Foods, which is based approximately five hours northeast of SHR headquarters in Smithfield, Virginia, is in its seventh season with Almirola and its first with SHR. Founded in 1936, Smithfield is a leading provider of high-quality pork products, with a vast product portfolio including smoked meats, hams, bacon, sausage, ribs, and a wide variety of fresh pork cuts. In 25 Cup Series starts this year, Almirola has earned an average start of 18.0 and an average finish of 14.0, with one top-five finish and 10 top-10s. He’s also led 115 laps this season, already a career best. Almirola rounds out the four-driver SHR contingent at 12th in the point standings. The season’s consistency on the track allowed Almirola to clinch his playoff spot after last weekend’s race at Darlington (S.C.) Raceway. You’ve clinched your spot in the playoff going into Indy. How does that feel? This is Johnny Klausmeier’s first year as a crew chief and he’s in the playoffs. What does that say about the No. 10 team as whole, and is it a cool feeling to accomplish this goal, given your history? How is your playoff approach different this time than when you first made it in 2014? All four SHR cars have secured playoff spots and there’s a good chance SHR will be the only four-car operation this season to have done that. What does that say about SHR? ​Aric Almirola will make his 270th career Monster Energy NASCAR Cup Series start and his seventh at Indianapolis Motor Speedway. With Almirola’s performance last weekend at Darlington (S.C.) Raceway, the No. 10 team has secured a 2018 playoff spot. The Stewart-Haas Racing (SHR) team is currently the only four-car organization with all four entries locked into the NASCAR Cup Series Playoffs. The Tampa native has an average starting position of 24.3 and an average finishing position of 22.2 at the iconic Indiana speedway. The 34-year-old also has one start in the Xfinity Series at Indy. In 2015, he started eighth and ended the day 14th. Ford has 12 wins this season with 10 of the victories coming from the SHR camp – Harvick with seven, Clint Bowyer with two and Kurt Busch with one. Harvick also captured the $1 million grand prize with a victory at the non-points-paying All-Star Race at Charlotte (N.C.) Motor Speedway.